The Polynesian Dog (Canis lupus familiaris formerly Canis pacificus) refers to a few extinct varieties of domesticated pariah dogs from the islands of Polynesia. These dogs were used for both companionship and food and were introduced alongside poultry and pigs to various islands. They became extinct as a result of the cross-breeding that occurred after other breeds of dogs were introduced. Modern studies done on the DNA of the Polynesian dogs indicate that they descended from the domesticated dogs of Southeast Asia and may have shared a remote ancestor with the dingo. These dogs were introduced by the ancestors of the Polynesian people during their settlement of the far-flung islands with a few major archipelagos developing isolated breeds. Tuamotuan Dog – introduced to the Tuamotus, this may have been a longer-haired version of the Tahitian Dog. Described by British naturalist Georg Forster. The distribution of Polynesian dogs on other islands was somewhat patchy. Islands like Mangareva, Tokelau and the Marquesas possessed domesticated dog populations after initial settlement that went extinct before the arrival of European explorers. On Easter Island no evidence or traces of dogs have been found in middens around the island or in the oral tradition of the Rapa Nui people. They were virtually absent from Western Polynesia (i.e., Samoa and Tonga) by the time Europeans arrived. However, dogs brought on European ships were recognized by the natives when they were introduced as items of trade, indicating a universal cultural recognition of dogs across the islands. While the Maori brought dogs to New Zealand, the Moriori had no dogs in the Chatham Islands at the time of European discovery. The Polynesians raised dogs for companionship and for food. Along with domesticated pigs and chickens, dog meat was an important animal protein source for the human populations of Polynesia. For the most part, they were fed a vegetarian diet of either breadfruit, coconut, yam or poi made from taro, while the larger Kurī predominantly subsisted on a diet of fish. They never became feral because of the scarcity of food in the native forests. The diet and environment of the islands resulted in a dog with small stature and a docile disposition, and European explorers described them as lazy. They were said to rarely bark, but would howl occasionally. The distinct breeds of the Polynesian Dog became extinct during the 19th and early 20th century due to interbreeding with introduced European dog breeds; declining consumption of dog meat was another contributing factor. Dogs were an important part of Polynesian narrative. They are often associated with the legendary exploits of the demigod Māui. According to Māori narrative, Māui transformed his brother-in-law Irawaru, husband of Hina, into the first dog which was used to explain the human characteristics of dogs. In the Tongan narrative, Maui-Atalaga and his son/brother Maui-Kijikiji attempted to hunt down Fulububuta, an enormous man-eating dog, larger than a horse, living in a cave on the Fijian island of Moturiki. However, Atalaga is killed and dragged into a cave by the monster which is later slain by Maui-Kijikiji who wastes away mourning his dead father. Proposed route for the migration of dogs based on mDNA. Haplotype A29 relates most to the Australian Dingo and the New Guinea Singing Dog, the ancient Polynesian Arc2 to modern Polynesian, Indonesian and ancient New Zealand dogs, and the ancient Polynesian Arc1 is indistinguishable from a number of widespread modern haplotypes. In 2011, the mDNA of dogs from the Malay Peninsula found that the two most common dog haplotypes of the Indonesian region, in particular Bali and Kalimantan, were mDNA haplotype A75 (40%) and "the dingo founder haplotype" A29 (8%). Also present were haplotypes A120 and A145. All 4 haplotypes fall within the a2 mDNA sub-haplogroup. The study also looked at archaeological specimens of ancient Polynesian dogs from which only a "short-haplotype" (a short sequence) could be derived. This short haplotype was named Arc2 and corresponds to mDNA haplotypes A75 and A120, and it could be found in 70% of samples found as far away as Hawaii and New Zealand. No dogs from Taiwan nor the Philippines carried the dingo or Polynesian haplotypes, which indicates that dogs did not enter the Pacific from a north-eastern route. 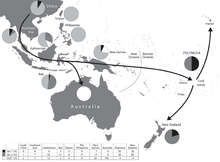 In 2015, a study looked at the mDNA sequences taken from ancient New Zealand kurī dog samples discovered at an archaeological site at Wairau Bar and found they correspond to the a2 mDNA sub-haplogroup. The dog samples all carried the mDNA haplotype A192, which has only been reported in some modern village dogs from Bali, Indonesia. When compared with the two ancient Polynesian haplotypes Arc1 and Arc2, all of the Wairau Bar dogs matched Arc2. Dogs from Wairau Bar likely represent part of the initial population of dogs introduced to New Zealand, having arrived with people around the beginning of the fourteenth century. All of these dogs carry haplotypes that fall under the mDNA a2 sub-haplogroup and are therefore descendents of a dog/Chinese wolf hybrid ancestor. In 2015 the most comprehensive study of mDNA haplotypes to date found that the a2 sub-haplogroup represents 3% of all dogs in South East Asia, 22% in the Indian subcontinent and 16% in East Asia. ^ Smith 1840, pp. 210–212. ^ a b c d e f Luomala 1960, pp. 193, 203, 221. ^ a b c d Titcomb & Pukui 1969, pp. 1–48. ^ Titcomb & Pukui 1969, pp. 2–24. ^ Titcomb & Pukui 1969, pp. 40–47. ^ Titcomb & Pukui 1969, pp. 32–33. ^ Titcomb & Pukui 1969, pp. 24–30. ^ Titcomb & Pukui 1969, pp. 30–32. ^ Haun 2008, p. 242. ^ Greig, Walter & Matisoo-Smith 2015, pp. 462–482. ^ Sharp 1964, p. 120. ^ Diamond 1997, p. 60. ^ Titcomb & Pukui 1969, p. 1. ^ Worthy & Holdaway 2002, p. 536. ^ Millerstrom 2003, pp. 144–152. ^ Luomala 1958, pp. 49–50, 202–203. ^ Luomala 1949, pp. 49–50, 202–203. ^ Smith 2015, p. 72. "Canis pacificus". IBIS-Mammals. Retrieved August 14, 2018. Diamond, Jared M. (1997). Guns, Germs, and Steel: The Fates of Human Societies. New York: W. W. Norton. ISBN 978-0-393-03891-0. OCLC 60820242. Duleba, Anna; Skonieczna, Katarzyna; Bogdanowicz, Wiesław; Malyarchuk, Boris; Grzybowski, Tomasz (2015). "Complete mitochondrial genome database and standardized classification system for Canis lupus familiaris". Forensic Science International: Genetics. 19: 123–129. doi:10.1016/j.fsigen.2015.06.014. Greig, Karen; Boocock, James; Prost, Stefan; Horsburgh, K. Ann; Jacomb, Chris; Walter, Richard; Matisoo-Smith, Elizabeth (2015). "Complete Mitochondrial Genomes of New Zealand's First Dogs". PLoS ONE. 10 (10): e0138536. doi:10.1371/journal.pone.0138536. PMC 4596854. PMID 26444283. Greig, Karen; Walter, Richard; Matisoo-Smith, Elizabeth A. (2015). M. Oxenham & H. Buckley, ed. Dogs and people in Southeast Asia and the Pacific. The Routledge Handbook of Bioarchaeology in Southeast Asia and the Pacific Islands. Abingdon, UK: Routledge. pp. 462–482. ISBN 978-1-317-53401-3. Greig, K; Walter, R; Matisoo-Smith, L (2016). Marc Oxenham; Hallie Buckley, eds. The Routledge Handbook of Bioarchaeology in Southeast Asia and the Pacific Islands. Oxford UK: Routledge. pp. 471–475. ISBN 978-1-138-77818-4. Haun, Beverley (2008). Inventing 'Easter Island'. Toronto: University of Toronto Press. ISBN 978-0-8020-9888-7. OCLC 166687891. Luomala, Katharine (July 1960). "A History of the Binomial Classification of the Polynesian Native Dog" (PDF). Pacific Science. Honolulu: University of Hawaii Press / Pacific Science Association. 14 (13): 193–223. hdl:10125/8347. OCLC 78130351. Luomala, Katharine (1949). Maui-of-a-thousand-tricks: His Oceanic and European Biographers. Honolulu: Bernice P. Bishop Museum. OCLC 16792306. Luomala, Katharine (1958). "Polynesian Myths about Maui and the Dog". Fabula. Berlin: Walter de Gruyter. 2 (1): 139–162. doi:10.1515/fabl.1959.2.1.139. OCLC 4958364642. Millerstrom, Sidsel N. (2003). Sharyn Jones O'Day; Wim Van Neer; A Ervynck, eds. Facts and Fantasies: the Archaeology of the Marquesan Dog. Behaviour Behind Bones: The Zooarchaeology of Ritual, Religion, Status and Identity. 1. Oxford: Oxbow Book. ISBN 978-1-78297-913-5. OCLC 891457752. Pang, J.-F.; Kluetsch, C.; Zou, X.-J. ; Zhang, A.-b. ; Luo, L.-Y. ; Angleby, H.; Ardalan, A.; Ekstrom, C.; Skollermo, A.; Lundeberg, J.; Matsumura, S.; Leitner, T.; Zhang, Y.-P.; Savolainen, P. (2009). "MtDNA Data Indicate a Single Origin for Dogs South of Yangtze River, Less Than 16,300 Years Ago, from Numerous Wolves". Molecular Biology and Evolution. 26 (12): 2849–64. doi:10.1093/molbev/msp195. PMC 2775109. PMID 19723671. Oskarsson, M. C. R.; Klutsch, C. F. C.; Boonyaprakob, U.; Wilton, A.; Tanabe, Y.; Savolainen, P. (2011). "Mitochondrial DNA data indicate an introduction through Mainland Southeast Asia for Australian dingoes and Polynesian domestic dogs". Proceedings of the Royal Society B: Biological Sciences. 279 (1730): 967–974. doi:10.1098/rspb.2011.1395. PMC 3259930. PMID 21900326. Titcomb, Margaret; Pukui, Mary Kawena (1969). Dog and Man in the Ancient Pacific, with Special Attention to Hawaii. 59. Honolulu, Hawaii: Bernice P. Bishop Museum Special Publications. pp. 1–48. OCLC 925631874. Sharp, Andrew (1964). Ancient Voyagers in Polynesia. University of California Press. pp. 120–. GGKEY:XL03UTGXNLD. Smith, Bradley (2015). The Dingo Debate: Origins, Behaviour and Conservation. Melbourne: CSIRO Publishing. ISBN 978-1-4863-0030-3. Smith, Charles Hamilton (1840). The Natural History of Dogs: Canidae Or Genus Canis of Authors; Including Also the Genera Hyaena and Proteles. Edinburgh: W. H. Lizars. OCLC 860931. Worthy, T. H.; Holdaway, Richard N. (2002). The Lost World of the Moa: Prehistoric Life of New Zealand. Bloomington, IN: Indiana University Press. ISBN 0-253-34034-9. OCLC 248051318. Clout, Stephanie Dale (2003). The archaeology, ethnography and mitochondrial genetics of the extinct Polynesian dog : a select annotated bibliography : submitted to the School of Communications and Information Management, Victoria University of Wellington in partial fulfillment of the requirements for the degree of Master of Library and Information Studies. Wellington: Victoria University of Wellington. OCLC 904068456. Luomala, Katharine (1960). Stanley Diamond, ed. "The Native Dog in the Polynesian System of Values". Culture in History: Essays in Honor of Paul Radin (1st ed.). New York: Columbia University Press: 190–240. OCLC 16324448. Luomala, Katharine (April 1962). "Additional Eighteenth-Century Sketches of the Polynesian Native Dog, Including the Maori" (PDF). Pacific Science. Honolulu: Pacific Science Association. 16 (2): 170–180. hdl:10125/5950. OCLC 16324444. Skinner, Henry Devenish (March 1933). "Origin and Relationships of the Polynesian Dog". The Journal of the Polynesian Society. Wellington: The Polynesian Society. 42 (1): 16–18. JSTOR 20702465. OCLC 6015261167. This page was last edited on 21 February 2019, at 21:09 (UTC).